July has been an extraordinary month. Yesterday the garden thermometer reached a heady 31°C, a kind of heat virtually inconceivable here in Cumbria. And it’s hardly rained all month. Most summers, if we’re lucky, we get at best get two or three consecutive days without rain. Some say it’s Too Hot but I’m not complaining. This is exactly what I call summer. Currently the Commonwealth Games are taking place in Glasgow one hundred miles north of Curthwaite. The organisers couldn’t have begged better weather. I’m delighted the rest of the world will discover Scotland can be hot and sultry however I was bemused when the captain of the Tongan team being interviewed on TV said his team had chosen to stay in Dumfries (as opposed to Glasgow) because it was just like Tonga. I’d never consider the city quite as exotic. The extended warmth has caused the garden to sprout beyond usual expectations. Our cottage is surrounded by what was formerly a field, and taming the flower beds requires far more time than I have available. And while I don’t mind leaving some areas to fend for themselves I would like to redeem the oblong patch which constitutes a front garden. For twenty years we ran our craft business from home but the only reminder of this is the cobbled path leading from the road to what was once the gallery entrance, except that door is now a window. The purpose of the path being long gone it now seems empty and lost. And the flower beds running against the walls at either side are full of pernicious weeds like couch grass. I’ve spent the summer mulling ideas, visiting lots of gardens to seek inspiration (what better excuse?) but still can’t decide on a plan. Perhaps I need a theme? That seems to be the fashion. The current theme is ‘wilderness’. I wish this was part of my garden but no fear aiming high – I took this photograph at Hidcote, a garden of inspiration. When we were last in Malta I was inspired by a garden dedicated to those men and women who’ve devoted their lives to peace. The garden uses native Mediterranean species but centres on one plant that has always symbolized peace – the olive. As soon as we returned I bought a little olive tree to remind me of that special garden – and it’s already doubled in size, bathed in Cumbrian sunshine. But I know it wouldn’t be happy in the middle of a Cumbrian winter, therefore it will have to remain in a pot, so it can winter indoors like the rest of us. Gardens reflect their owners. That can’t be helped. 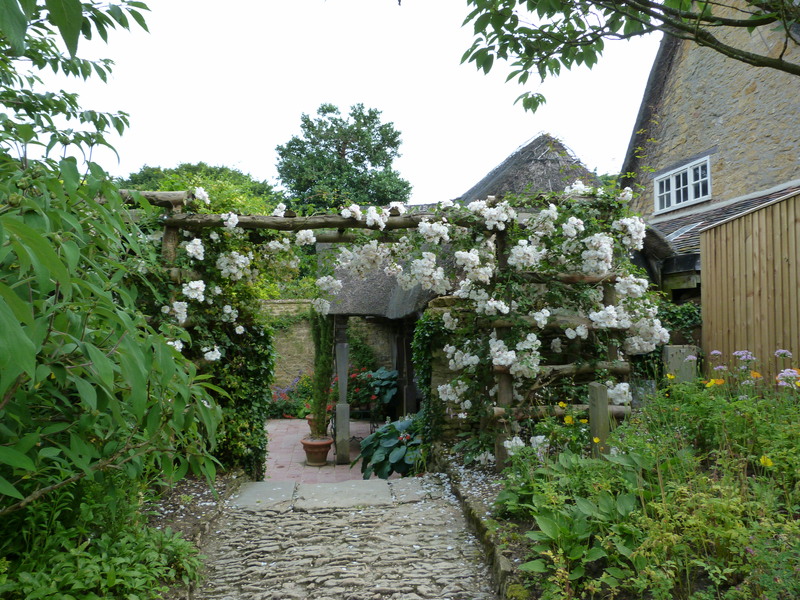 But when a garden is a joint effort it follows that it must integrate sometimes diverse interests. My husband hates roses so their care is my concern. 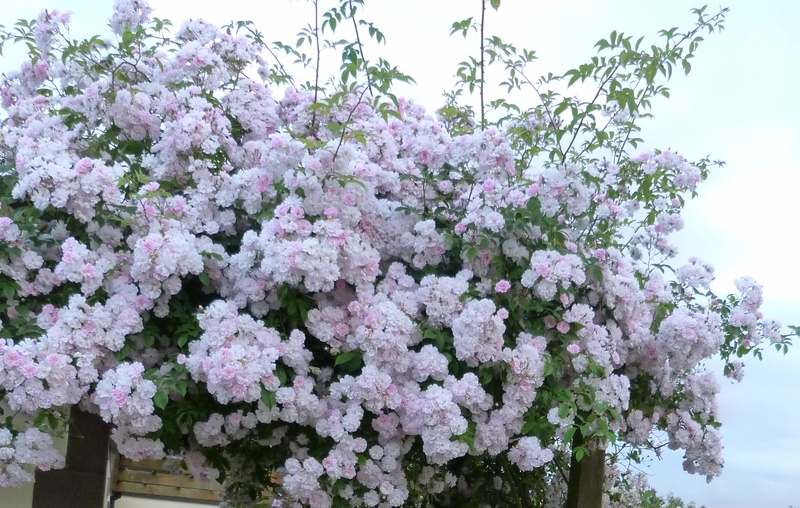 Just like most flowers the rambler on the porch has rambled rather too far this season but even with our longest ladder I can’t clip the overspill. He said I’ve been encouraging it by putting fertiliser around its roots. It gave a truly magnificent display in June, earning it’s keep as far as I’m concerned. However it was only when my mother asked where I’d planted the lovely David Austin rose she bought for my birthday last year that I realised I hadn’t seen it since. Ranging the perimeter for clues I found it, defined by its plastic container, hidden amongst the rubble at the top of the garden, on the verge of death. No need to ask who’s responsible. Paul’s Himalayan Musk, being invincible. I really enjoy reading all your posts, Anna. they are filled with beautiful prose, and lively comments. Thank You Veronica, for your kind encouragement. I was hoping it wasn’t too sedate but this lovely weather has made me relax, if not quite stop.